ARM has announced yet another addition to its bulging porfolio. After the Cortex-A12 late last year, the British company has just unveiled the Cortex-A17, which is set to replace the former in 2015 and is pitched as the "enhanced mid-range mobile and consumer solution" for next year, targeting $200 (around £150) devices. TechRadar Pro spoke to James Bruce, mobile marketing lead at ARM, prior to the announcement and he confirmed that the IP attached to the product will be released by the end of Q1 2014 with the first products likely to appear this time next year, possibly to coincide with MWC 2015. This shortened time-to-market approach is in stark contrast with the multi-year process that characterised the development of other previous solutions such as the Cortex-A8 or the six-year old Cortex-A9. Bruce said that this "is a reflection of the mobile market with silicon partners and OEMs were cutting time to market in order to get products out as quickly as possible". As such, the go-to-market window for the A17 is shorter than a year although one might suspect that the first designs will be based on ARM's standard packages. 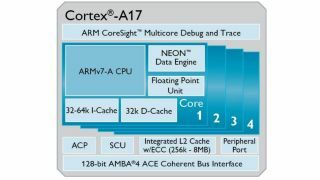 The A17 is likely to perform on the same level as the A15 (60 per cent faster than the A9 is the official line) while consuming 20 per cent less power compared to the A9, all things equal; it means that the A17 will be better suited for mobile phones compared to the high performance but power hungry Cortex-A15. It will run at up to 2GHz initially (with higher clock speeds available in subsequent iterations) and can work as designs of up to eight cores (two quad-cores). Technically, the new part is similar to its immediate predecessor, the A12 and improves on it thanks with the addition of memory subsystem improvements, support for big.LITTLE and up to 8MB L2 ECC cache. Together with the Mali-T720 GPU, the Mali-V500 VPU and the Mali-DP500 DPU, the Cortex-A17 completes ARM's mid-range multimedia solution. ARM's mobile marketing lead also confirmed that 28nm will be the standard node for the A17 for a foreseeable future (at least until 2016) and that this part is likely to be the last high performance 32-bit part from ARM, hinting at the fact that 64-bit mainstream parts are likely to be announced between now and 2015. 32-bit will not go away overnight though with ARM expecting it to play a significant part in its portfolio until at least 2017. Check out our interview of Dennis Laudick, video president of partner marketing at ARM, about ARM's recent acquisition of Geomerics.